There are solid-state drives with big storage capabilities, and itty-bitty solid-state drives that fit nicely into ultra-slim notebooks, but there are no itty-bitty SSDs with big desktop-class storage capabilities. Well, at least until today. On Monday, Samsung announced the 840 EVO mini-SATA SSD, which packs a full 1TB of blazing-fast solid state storage into a pint-sized 1.5-inch mSATA form factor. That's a full inch thinner than a standard 2.5-inch laptop hard drive. 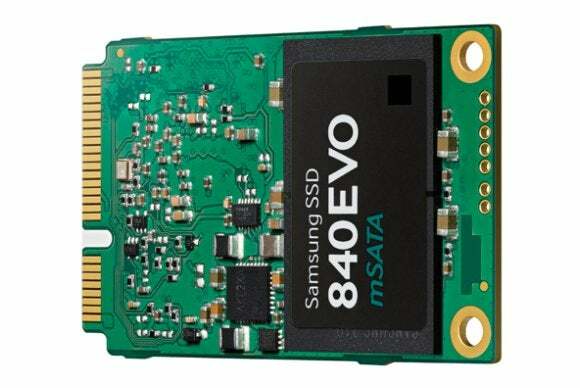 The new 840 EVO is the first mSATA drive to crack the 1TB barrier, and it didn't sacrifice any speed to do so: According to Samsung, the SSD hits 540MB/s write and 520MB/s read times, and it packs the same TurboWrite technology as its standard-sized 840 EVO brethren. Speaking of, the 2.5-inch 840 EVO SSD delivered a big speed boost to the bevy of notebooks we tested it with earlier this year. Here's hoping the mSATA variants are just as impressive. Samsung's 1TB 840 EVO mSATA drive will launch globally later this month, alongside cousins packing 120, 250, and 500GB of storage space. Alas, Samsung's staying mum about price points for now.